I smell a plot – and a very nasty odour it leaves in my nostrils. At midnight on Tuesday the deadline for registering your right to vote in the EU Referendum expired. Or at least it was supposed to. We had been warned about the strict time limit for weeks. The Electoral Commission (set up and financed by the Government) produced some glossy TV adverts to remind us about the rules and sent every household a detailed leaflet with everything we needed to know. This exercise cost millions of pounds of taxpayers’ money. Happily the digital revolution made the process of applying for a vote very easy. All we had to do was go online and fill in personal details. 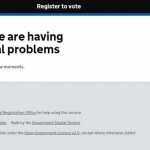 But so many people – presumably young people – left their applications until the fifty-ninth minute of the eleventh hour that the government computer system became hopelessly overcrowded and gave up the ghost. Oh dear. Very unfortunate. What a pity. Perhaps as many as half a million late-comers were thus prevented from registering their right to vote. Shame they didn’t buckle down to doing it a whole lot sooner. It only takes ten minutes to fill in the form. But maybe they were too busy. Or couldn’t be bothered. Tomorrow perhaps, they said to themselves. And then, all of an idle sudden, it was June 7th and they were running out of time fast. I remember being a student. Beer was very important. Democracy came fairly low on the agenda. Rules were there to be broken. Deadlines to be missed. But there was always a price. If you overslept for a lecture you learned a lesson about the need to keep up with your studies. If you forgot to apply for those rock concert tickets you certainly didn’t get one. If you missed the last bus home you jolly well had to walk. And when you eventually secured a job and needed to submit your tax return they charged you £100 a day for sending it in late. HMRC still do. That, ladies and gentlemen boys and girls, is life in the real world. 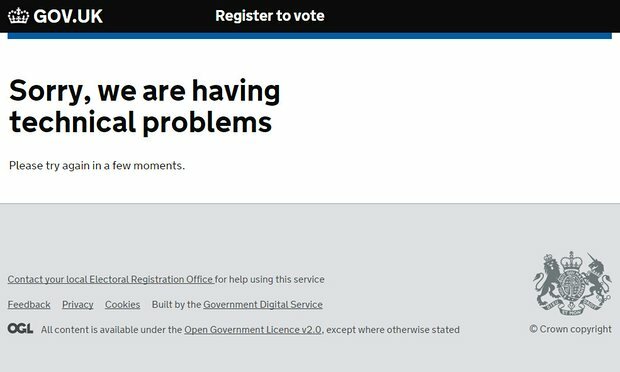 No doubt among those who fell foul of the last minute computer glitch are many people, young and old, who had every intention of registering properly. I have sympathy for them. It is absolutely right and proper that those who tried and failed through no fault of their own should be given a fresh chance. But those nice people in Her Majesty’s Government are so terribly keen for everyone to take part in this Referendum that they are now prepared to bend over backwards. In fact they are performing ridiculous acrobatic contortions. The deadline has been extended. Not by a few hours, but probably two extra days! This is where the stink comes from. In the political trade it is the foul aroma of what I fear may be “gerrymandering”. A crude attempt, some people think, to buy time and support for the EU cause by deliberately shifting the goalposts. If the Remain camp had been convinced the Referendum was already won you wouldn’t be witnessing any of this right now. But there is real suspicion that with the gap between Remain and Leave so narrow the remainers will stop at nothing to secure more support. I have kept my trap firmly shut during this campaign. It is not my job to try and influence anyone’s vote. My website carries the arguments of all sides without any comment whatsoever. That seemed to be the fairest way of helping my constituents to make up their own minds. However, deliberately stretching a fixed legal deadline in order to accommodate extra applicants simply because they are thought to favour a vote to remain in the EU is a step too far. Almost a goose step. I think what the Government is trying to do is fundamentally immoral and may well turn out to be thoroughly unlawful too. At best it sets a very poor example to us all. If you miss the last bus from Bridgwater tonight will they miraculously provide another one, and maybe another one after that? If you fail to go to the polling station on June 23rd will they let you come again on June 24th? If Robert Mugabe did it we wouldn’t be greatly surprised. But this is Britain, not a bent banana republic.